Another natural disaster.. an 8.8-magnitude earthquake struck central Chile early Saturday killing at least 78 people, collapsing buildings and setting off a tsunami. 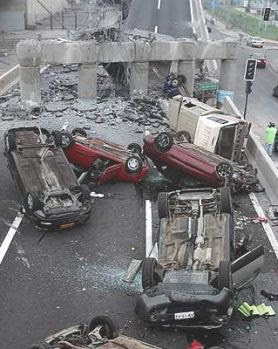 Image below from The Star shows vehicles along a highway that collapsed during the earthquake near Santiago are seen overturned on the asphalt. - The quake hit 200 miles (325 kilometres) southwest of the capital, Santiago, at a depth of 22 miles (35 kilometres) at 3:34 a.m. (0634 GMT; 1:34 a.m. EST), the U.S. Geological Survey reported. - The epicenter was just 70 miles (115 kilometres) from Concepcion. - A huge wave swept into a populated area in the Robinson Crusoe Islands, 410 miles (660 kilometres) off the Chilean coast. - Tsunami warnings were issued over a wide area, including South America, Hawaii, Australia and New Zealand, Japan, the Philippines, Russia and many Pacific islands. - In the 2 1/2 hours following the 90-second quake, the U.S. Geological Survey reported 11 aftershocks, five of them measuring 6.0 or above. - The airport for Chile's capital of Santiago airport was shut down and will remain closed for at least the next 24 hours. - In Santiago, modern buildings are built to withstand earthquakes, but many older ones were heavily damaged. - President Michele Bachelet said she was declaring a "state of catastrophe" in three central regions of the country. Chile has not asked for assistance from other countries. - Several hospitals were evacuated due to earthquake damage. Looking for Boston Real Estate? 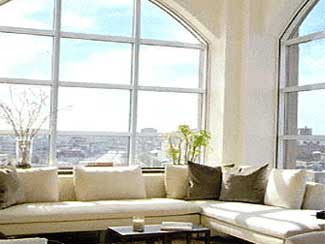 If you are looking to buy real estate in Boston, you may want to check out Bushari Group Real Estate. 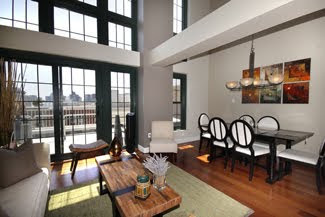 They have a wide listing of properties from Boston Condos to Boston lofts as well as Boston luxury lofts and Boston luxury real estate. Search from their thousands of listings categorised into Property types, Attributes, Price and Region. On the other hand, if you have a property for sale, you can contact them to have it listed with them. They are the best in marketing the Boston luxury real estate for sellers and finding the right Boston luxury real estate for buyers. Animals are not having it any better in this heatwave. 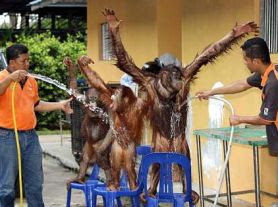 The Star took this picture of primates being hosed down by their keepers at the Malacca Zoo. They are given more baths than usual to keep them hydrated in the current hot spell. On a similar note, firemen are on the alert as heat wave threatens to worsen. There has been a number of fires of late. Many homes here are not insured. Home-owners would do well to seriously take some remedial action to rectify this, afterall free insurance quotes can be easily obtained. Friday Frolics - How Boyish or Girlish Are You? Ooh... revelation!! LOL! Your turn..
Work is Hard. Time for frolicking! Stumbling upon the AMACO/Brent website of Supplies for Pottery, Education & Crafts reminded me of a girlfriend who makes beautiful ceramic pieces. I call them exquisite artwork. She gets her supplies from a local crafts store. I need to forward her this well-stocked supplier so that she can have a wider range of pottery supply to choose from. She is even thinking of having her own kiln so that she doesn't need to bring her pieces to fire at the craft center. Who knows, she might be able to get one there. If you are a potter, I think you will love this site. I know my girlfriend will. 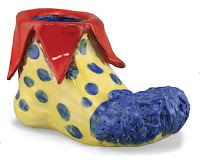 AMACO/Brent stocks a wide range of pottery supplies from the many different types of lead-free glazes, including majolica glazes to clays, brushes, Brent potters wheels & wheel replacement parts, slump molds, Kilns, and more. If you are an Art & Craft teacher or perhaps someone who enjoys crafts, you have got to check out their Craft Library and Lesson Plans. There is a treasure trove of craft ideas here. AMACO.com is a wonderful resource center designed for artists, teachers, students, professional potters and craft artists where they can network and share ideas, techniques, upload galleries of artwork or classroom projects, post special events charity events, and workshops. I have not been to any mall since the last lunar year (sounds so long ago) but from what I gathered from friends and colleagues, there are some pretty good sales still going on. Clothes and Chinese New Year cookies, even oranges are going at much reduced prices, as low as a 50% discount! If you think you need a little fitness after all those food feasts, nordic track coupons for gym equipment may be what you need. These days, being able to purchase show tickets online is not surprising but having tickets delivered to your doorstep is something else. In the US, ACheapSeat.com is one such ticketing site that delivers tickets and by Fedex too. 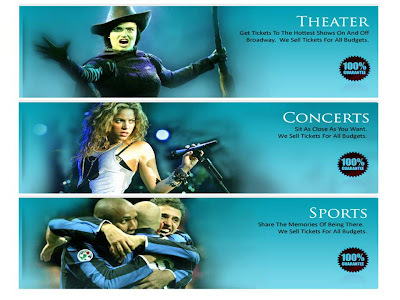 A Cheap Seat is a professional ticket broker with access to many events in the US - theatre, concerts, sports. They provide the hottest deals on premium tickets every day. If you enjoy music by Enya, you will like Celtic Woman. You can check out their concert schedule and make a booking for Celtic woman tickets. Looking for TOWER THEATRE TICKETS? A Cheap Seat has them too. Check out the event calendar to secure your tickets for the theatre shows, concerts, and sports games you intend to watch. If I were living in Franklin, Massachusetts, and looking for insurance, I would certainly consider buying from Berry Insurance Agency. They will shop the top carriers to find you affordable and comprehensive insurance products. Berry Insurance is an independent insurance agency, providing insurance protection for the people of Massachusetts, Rhode Island and all of New England. If you are in those areas and are looking to buy insurance, it may be worthwhile to call them up for a free quote or you can visit them online. For general insurance, a google search for Insurance Franklin, MA will get you to their site. Searching for Auto Insurance Franklin, MA and Homeowners Insurance Franklin, MA will also bring you to their site. Gold is on the move again as it reaches its highest price in almost two weeks. As the dollar continues to weaken, gold is increasing its appeal as an alternative investment. For centuries, gold has been used as a preserver of wealth. The Greek debt situation is causing a concern for investors and with no clear direction as to its aid, investors are playing it safe by turning to gold. While everyone is watching gold, China has been quietly accumulating its gold reserve. Amid economic uncertainty and financial turmoil, gold will continue to have a positive outlook for the future. The recommendation is to buy gold bullion if we want to preserve our wealth and purchasing power. If an adult vacation (as in the earlier post) is not exactly your cup of tea, how about a golf vacation in the US of A? 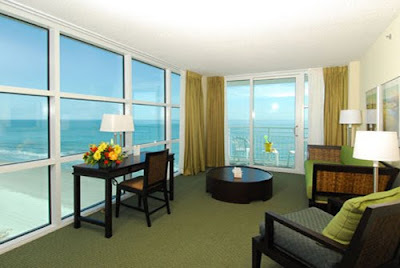 And how does a vacation at Myrtle Beach staying at an Oceanfront Myrtle Beach Hotel grab you? There really are a number of good hotels on Myrtle Beach. Located directly on the ocean, the new SeaSide is a luxury boutique North Myrtle Beach condominium resort with spacious accommodations and attentive 4 star services. Their spacious condominiums are comfortably furnished with fully-equipped kitchens and large living and dining room areas. Just look at this awesome view from the room! If I were a golfer looking into playing a few rounds of golf, this Myrtle Beach Hotel would surely be where I would be staying. SeaSide is one of the new and better Oceanfront Myrtle Beach Hotels currently which features a wide selection of special golf packages at fantastic prices for the ideal Myrtle Beach golf vacation. 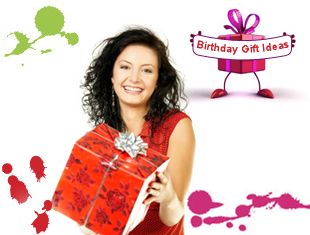 Are you one of those who are always at a loss for gift ideas when a birthday comes around? I know of people who are like that. You too? Here are some Birthday Ideas you would be surprised you hadn't thought of earlier. Show tickets are a great birthday idea. Shows are something that many people enjoy but do not get around to planning them into their schedule. Further surprise them by driving them to the venue and seeing their excitement when they realize what they are about to see. A get-away is a super birthday idea. Many people are too busy to plan for a vacation so a long weekend at a resort, a one night stay at a theme park, a spa weekend, or hiding away in a cabin for a few days are all popular birthday ideas. Great birthday ideas for mom include helping her pick up her bath and beauty products or her color refills for her printer. Same goes for dad on his birthday. He will appreciate little thoughtful gifts too such as gifts that support his hobbies or a plate of his favorite cookies. Gift vouchers or gift cards are practical gifts too. Now you won't be at such a loss for birthday ideas. Skin conditions, such as eczema, are tough to tackle sometimes. Though there are creams and such to treat the condition, it is best to know the cause in order to get a proper fix. However, having eczema is anytime better off than having psoriasis. I know a few people with the latter and it certainly isn't fun. And this hot and humid weather is not helping. Don't we all take our good health for granted.. The other day, I bought two different cookbooks. No, not for myself (though I have bought one of them for myself earlier) but for two friends who love cooking. When it comes to gifts, I like to get practical or functional items, something that the recipient will be able to make use of. Don't know about you but I find that getting gifts for her is easier than getting gifts for him. Ladies, do you feel the same? Guys, can you suggest some gift ideas? What would you like to receive as gifts? We all work hard, though some work harder. So, it only makes sense to play harder as well. Ever thought of going on a singles vacation where good times and pleasure know no bounds? Where you can sleep in, stay up late, give up counting calories, have a drink before noon, give up mineral water, dine in shorts, talk to strangers, don't make your bed, go skinny dipping, don't call your mother, don't pay for anything, don't leave a tip, be your beautiful self and more? All the above are possible if you join one of those adult vacations in one of those adult resorts in Negril or Runaway Bay in Jamaica. Thought I'd talk about the article that's frontpaging The Star today. It carries the title "Reckless lot" as it highlights the reckless and lawless behavior of road-users in Malaysia. I couldn't agree more that road-users here (read vehicle-drivers) take road-safety laws lightly. Is it little wonder that our road accident statistics are nothing to brag about? Which reminds me I am thinking of changing my insurance agent. Will need to start asking for new auto insurance quotes. Below is borrowed from the paper showing proof of the unlawful behavior. Uh-oh, if your vehicle is in the picture, it's going nationwide and worldwide, naturally, considering that it's being read across the world where there are Malaysians. The gentleman in the picture is Datuk Solah Mat Hassan, Director General of the Road Transport Department (JPJ). 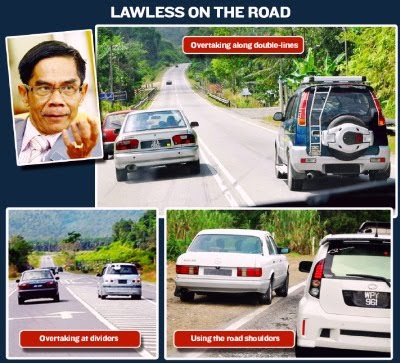 On his way from Kota Baru to Kuala Lumpur on Wed during the ongoing Ops Sikap XXI, he managed to photograph 93 cars blatantly flouting traffic rules. The DG was shocked to see drivers overtaking along double lines, jumping queue using the emergency lane, using the road shoulder and driving dangerously. Btw, the offenders will be slapped with the maximum fine of RM300. 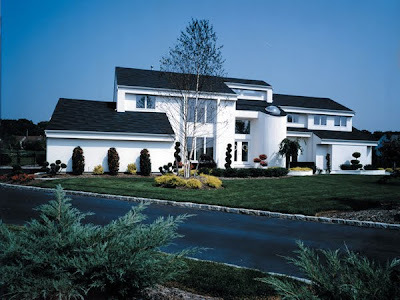 Houseplansandmore.com offers a wide range of home plans all efficiently categorized making your search simple and easy. The site offers a variety of home building resources and helpful tools. If you are in the US, you can use the site to locate a builder in your area. Whatever your style or budget, the site has just what you need be it modern home plans or traditional home plans. With such a wide range of architectural styles available, who knows, you might find the home floor plan for your dream home here. Oops! I think I need to go on a food diet or maybe employ some diet aids. 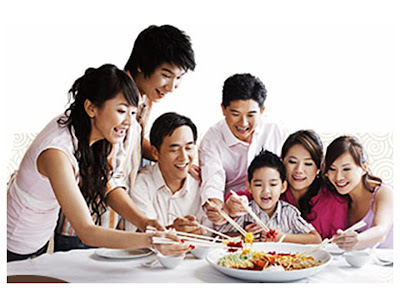 All these food feasts during the Chinese New Year, though joyous, are really not so good for the waistline. To make it worse, there are the jars and jars of delicious cookies in between meals. But then again, Chinese New Year festival without all that fabulous food wouldn't be the same, would it? So, has it been a nightly "loh hei" for you, so far? Many of us are naturally attracted to sports, either actively involved in the game(s) or watching it/them. Others take the enjoyment a step further by participating in sports betting. For that, one needs to be well-versed in the game, either from knowing the game well personally and/or continually getting new information from the media. Having knowhow about sports betting involves not only knowing the game. It involves knowing the art and skill of sports betting itself. SportsBettingSpot.com is a site filled with useful information for anyone who is into sports betting. The site covers sports played in the US, such as baseball, basketball, football and hockey. For the avid, the site provides up-to-date information and news about the game, the players, as well as sports betting tips and guides - enough for you to make informed decisions. For those just starting out, you will be able to learn quickly the ins and outs from the tips the site provides. No matter how experienced or new you are as a sports bettor, you will no doubt benefit from the site's smart strategies. Molton Brown is hardly known this part of the world though it has been around in the UK for a while now. Molton Brown has a wide range of products including for hair care, skincare, bath and body, cosmetics and others. You might be happy to note that Molton Brown products are not tested on animals. In the perfume department, Kai body and perfume products are much sought after whose many devotees include celebrities such as Julia Roberts, Charlize Theron, Reese Witherspoon, Jennifer Garner, Naomi Watts and many others. Kai Body Buffer and Body Butter has been featured among Oprah's Favorite Things. Ladies, want safe home hair treatment alternative to expensive salon treatments? Check out their Liquid Keratin and the Keratin Complex products. Liquid Keratin nourishes and replenishes damaged and chemically-treated hair. Unlike salon treatments, Liquid Keratin does not contain harmful chemical ingredients such as formaldehyde. Gong Xi! Gong Xi! Gong Xi Fa Ta Cai! Hi, Everyone! 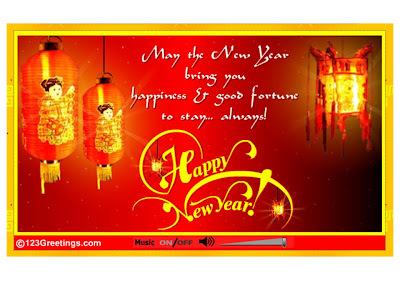 Greetings and best wishes again for a Happy, Healthful and Prosperous lunar new year! For those of you who are celebrating this festival, hope you've had a great time with your family and friends and for the rest, hope your holiday and/or Valentine's Day was just as awesome! Have you started work or are you keeping to the lucky day to start work schedule? hehe.. I know that when I go back to work, I'll be missing the presence of two colleagues who have decided to switch careers. Sad to see them go but life's like that - friends come and go. We can only wish them well when they leave. Looks like it is going to be yet another hot humid day in Kuala Lumpur as people go about their business and Chinese New Year is barely a week away, six days to be exact. 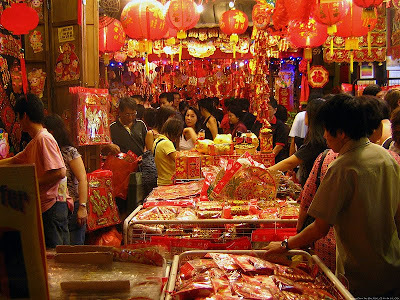 Chinese New Year falls on Feb 14 this year - the same day as Valentine's. 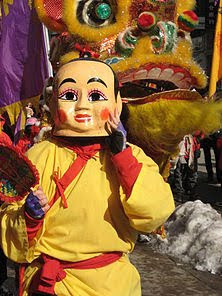 The Spring Festival or more commonly-known as Chinese New Year here is celebrated by all people of Chinese descent, religion aside though many mistake it as a Buddhist or Toaist festival. In actual fact, it is a festival of tradition, not a religious-driven festival. Sadly, it has been misconstrued. 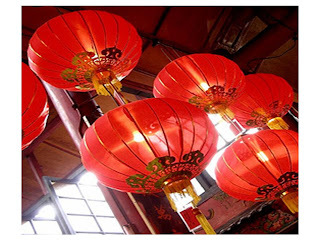 Wikipedia says that Chinese New Year is the most important traditional Chinese holidays but it is not. Winter Solstice is believed to be the most important festival. It is celebrated yearly on Dec 22, give or take a day before or after, some years. Many of us are looking forward to the celebration and the extended weekend holiday when we can dress up in new clothes, have great food feasts, get together with friends and family, and just chill. After all the festivities, many among us would want to know as to the good days to start work to begin the new year of the tiger on the right auspicious footing. Below is a guide, courtesy of wayangtimes.com. In a nutshell, the good days are Days 4, 6, 9, 12, 13 and 15. 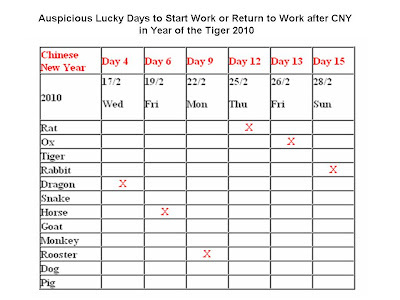 However, if you look closer at the chart, some of these dates may be inauspicious for certain animal signs of the Chinese zodiac/horoscope, so do check it out. (The “X” denotes inauspicious start date for those affected.) I read that for small businesses, Days 12, 13 and 15 are better days to start work. 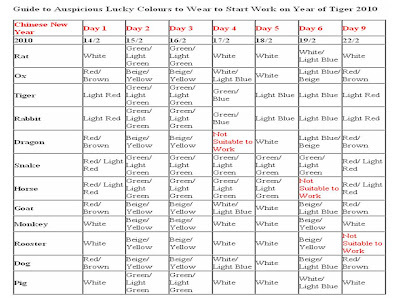 There is even a guide on the lucky colors to wear but I won't go to that extreme. However, if you are interested, you can refer to the chart below, also courtesy of wayangtimes.com. Click to enlarge image. Are you familiar with the name Shepard Fairey? No? Next question. Are you familiar with this poster? 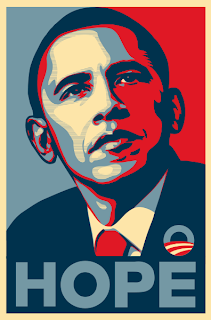 This Barack Obama "HOPE" poster was created by Shepard Fairey for the 2008 US presidential campaign for which he became more widely known. Shepard Fairey is a political artist specialising in stencilling. He is also an artist hired by corporations for consumer campaigns whose prints are being used on t-shirts, skateboards and other paraphernalia. Authentic out-of-print Shepard Fairey prints and other collectibles are now being offered to the public. 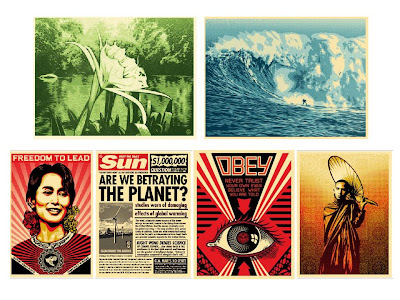 The Obey giant prints are among the most popular art pieces. Below are just some of the prints available. Malls are bustling with shoppers this time of the year, doing their last-minute shopping for clothes and other items for the Spring festival or the Chinese New Year. The streets around Chinatown are a challenge to navigate this time of the year. Still a visit to that part of Kuala Lumpur makes for a good experience. Each year, a girlfriend of mine would do lots of shopping including buying clothes for her nieces before she goes home for the celebration. Having been in the US for a number of years, she often compares the brands available overseas and what we have here. She said somehow the clothes overseas are of better quality and there are more choices. Not only clothes, there are more quality toys over there. Just the other day, I was going through some toys and children's clothes site and came across some interesting finds. 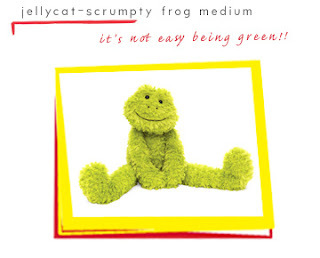 There is this online store that has a good range of jellycat plush soft toys and activity books that will surely broaden a child's horizons. 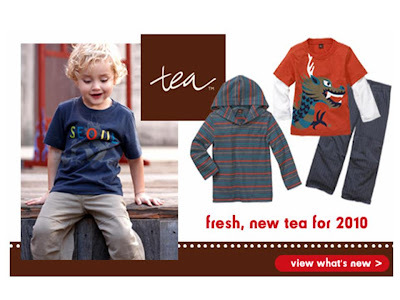 There is also a wide selection of children's clothes, some even organic, including brands like barefoot dreams, room seven, appaman, tea collection and more. They are clearing winter stock currently which could mean substantial savings for shoppers who buy now. If you are looking for tuition for your kids, you may want to check out this online tutor service. Tutornext.com provides high-quality one-on-one supplemental education for K-12 and college students for all subjects and there hundreds of tutors online anytime ready to provide help. If Maths help is what your child needs, A Math Tutor is available anytime offering Math help around the clock. Their team of highly qualified Math tutors online make learning fun and easy for your kids where they can get detailed step-by-step explanations for a better understanding of concepts, prepare for important tests and quizzes, improve their grades and get their assignments done on time. Whether your child needs regular Math Tutoring, Homework Help or some quick assistance in solving Math problems before a test or an exam, an online Math tutor will be on hand to help. Will skilled tutoring, your child will be a Math problem solver himself in no time. Why not give them a try and have your child sign up for their free online tutoring which your child will find helpful and convenient. Ahh... it's quiz-day again. I know some of you are turned off by these quizzes. The reason behind putting up these quizzes is simple really. I am a simple girl. Having a weekly quiz provides a pleasant break from the routine of writing. I find the results amusing mostly and thought I'd share the laugh here. I can't be putting up the quiz and not share my results, can I? I kinda think it's not nice that way. So, I hope my intent of putting up these quizzes is not misconstrued. I just want to inject some fun and a giggle in here. If you enjoy these quizzes as much as I do, I'm glad, but if you choose to skip them, that's fine too. It's a free world. Now, let's do the Book Test, shall we? You tend to have your feet on the ground. You think about what's actual, and you love facts. You are a sensitive person. You find it easy to be emotionally effected by books. 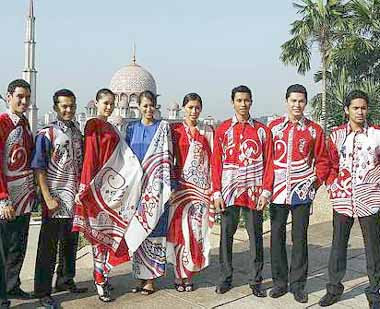 Nice new improved batik designs for 1Malaysia, don't you think? Red and white. Reminds me of AirAsia. But then again, red and white is a pleasant combination on almost anything, including clothes. Looks like a good outfit to add to your wardrobe especially this Chinese New Year. With our tropical weather, batik is a practical alternative to wearing a suit for official functions. It is a good idea to have a piece or two, just in case. These are created by Kraftangan Malaysia and there is a choice of seven designs to choose from. Do you drink water straight from the tap? Yeah, do you drink water straight from the tap? I do. We are lucky that water here in Malaysia is clean enough though we have been advised to boil the water before consumption. I'm not sure if it's a culture here or just in Chinese society, but I do know that all Chinese families (I mean local immigrant Chinese) drink boiled water - boiled water that has been let to cool. Families in recent years have added another source of water into the household - filtered water. With pollution all around us, most households have installed water filters and they do help to eliminate pollutants making water cleaner thus tasting better. When it comes to water filters, people are more familiar with Diamond this part of the world forgetting that there are other just-as-effective water filters. 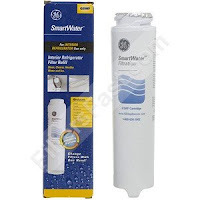 The GE SmartWater gswf Refrigerator water filter is one. So, are you using a water filter at home? Thought I'd post videos of some of the winners. For pure (visual) entertainment, Lady Gaga's wins hands down. If you want more of her, check out YouTube. I recommend Bad Romance and don't miss the last bit. Hilarious! And now back to the Grammys.. Enjoy! Buying machine parts such as actuated pneumatic valves is not as simple as buying a book, for instance. In order to get the machinery working at optimum level, quality and precise parts are to be used. It is always advisable to source parts from authorized suppliers. 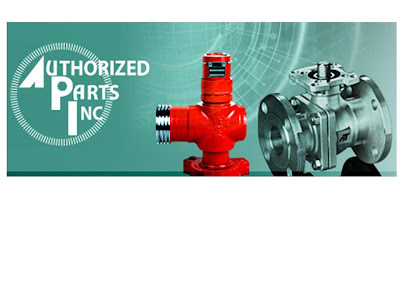 If you are looking for precision motor control products, valves and piping parts, do check out Authorized Parts, Inc. They are the “go to” guys for control, process and power products, worldwide. They supply valves; contactors, relays & transformers; actuators and pump parts. Some of us in KL had the opportunity to watch the Grammys live this year, being KL City Day (or Federal Territory Day) which was a holiday. Glamorous and pitch-perfect as ever, Beyoncé was the top winner on Sunday, her six prizes the most in one night for any woman in the awards’ 52-year history. 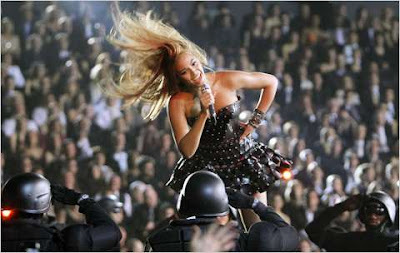 Among the awards is song of the year for her anthem “Single Ladies (Put A Ring On It)”. 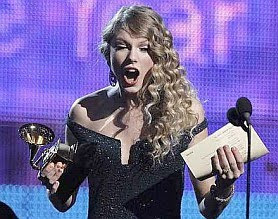 However, it was Taylor Swift who nabbed the top honour, album of the year, for her best-selling “Fearless.” Taylor won a total of four awards. If you are interested, here's the complete list of winners. I find the Grammys more interesting to watch than the Oscars. 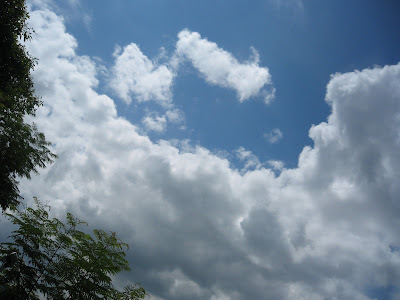 It has a more vibrant atmosphere and the fashion is more exciting. Lady Gaga has my vote on daring to be different. Here's what she wore..
And this is she again with her awards.. The Red Carpet moments are also fun to watch in terms of fashion. You can see some of them below and more at Red Carpet at the 2010 Grammy Awards and at 2010 Grammys: Arrivals. And this kid looks so cool! 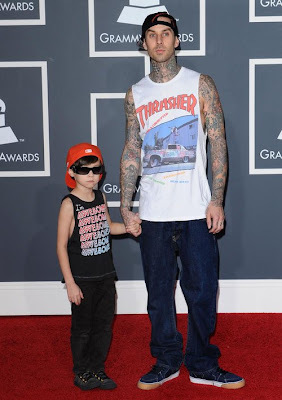 He's Landon, adorable 6-year-old son of Blink-182 drummer, Travis Barker. They both rocked the red carpet at the 52nd Annual Grammy Awards in Los Angeles on Sunday. Travis teamed up with hip hop stars Eminem, Lil' Wayne and Drake to perform at the awards ceremony. 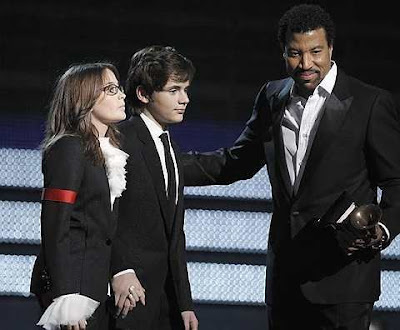 Michael Jackson’s young children, Prince and Paris, accepted a lifetime achievement award for their late father. “Through all his songs his message was simple, love. We will continue to spread his message and help the world,” Prince said. With the Chinese New Year just barely two weeks away, shopping malls and markets are packed with shoppers. I haven't been to Chinatown yet but there is no doubt that the place will be crowded with locals buying the Spring festival goodies and tourists enjoying the hustle and bustle of the place. There is certainly no let-up on consumer spending as department stores are again having their big sale just before the Chinese New Year. Clothes, shoes and bags would top the list of purchases as it's customary to have new clothes and related new stuff to usher in the new year. Even fitness equipment stores are having their sale to encourage people to get back in shape for the new year. Have you done your shopping yet? A girlfriend asked that I help her check out luggage online with a view to buying a piece or two to replace her old ones. She is set to travel on business in 2Q. 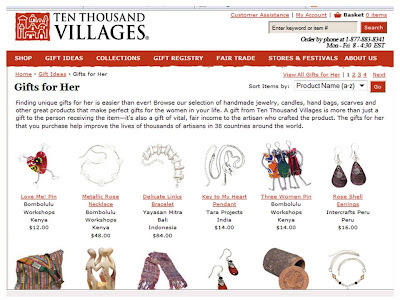 One site I found with a wide range of brands is VillageLuggageandGifts.com. A few brands caught my attention. Hartmann luggage is stylishly-designed with the finest materials and elegant craftmanship. Time honored Hartmann collections feature leather and antique hardware details. I think my girlfriend will appreciate the classic good looks and impressive durability of Hartmann luggage. Plus, Hartmann luggage is on Sale now which means with the savings, she could buy another piece. Delsey luggage may be her choice with additional packing space, attractive finishes, and durable materials. Delsey has always been committed to offering top quality at the lowest prices and they have also redefined the term “lightweight” within the travel industry. 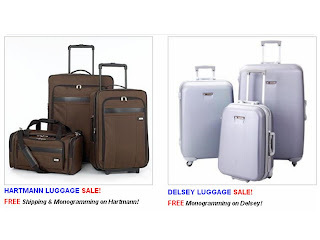 Delsey has a great selection of lightweight luggage and carry-ons. They are all on Sale too. My girlfriend did not mention about garment bags but I have also included those in my search and it brought me to Tumi luggage. They have a collection of superior Tumi garment bags and carry-ons, Tumi duffles and uprights. 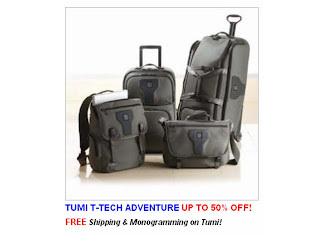 Purchase of Tumi luggage comes with FREE shipping and Monogramming. They are slashing prices too for the Tumi brand.